Rei Sato, Explorer of Hong Kong! 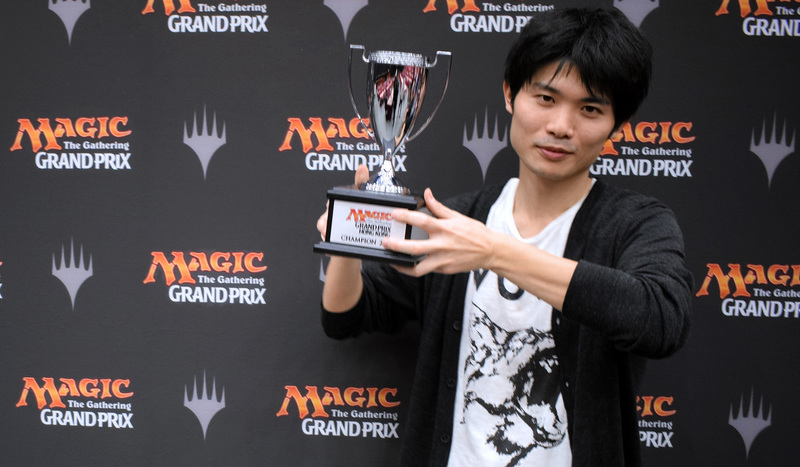 Rei Sato explored his way to victory in Hong Kong with an innovative Blue-Green-Black deck! After nine rounds of Ixalan Sealed Deck and nine rounds of Ixalan Booster Draft, the field of 731 players was down to just a single one. Cruising through the Swiss Rounds and steamrolling through the Top 8, it was Rei Sato who emerged victorious. Defeating finalist Farand Lee with a unique deck containing Lurking Chupacabra and double Wildgrowth Waker, he was able to explore his way to victory! 14th-ranked Lee Shi Tian tried to defend the trophy but fell in the semifinals. Nonetheless, we was happy to make his 10th lifetime Grand Prix Top 8, while becoming exactly the 50th player in the entire history of the game to achieve this feat!Semifinalist Jacob Hart also made a triumphant return to the Top 8 stage after an absence of over a decade. As the only player to go 12-0, he was the first player to secure his spot in the Top 8 this weekend. This was his fourth lifetime Grand Prix Top 8, with his previous three occurring in 2002, 2003, and 2006! The quarterfinalists Kazuyuki Takimura, Vinod Prabhu, Hoi Chick, and Tay Jun Hao should not be too disappointed either, because everyone was now qualified for Pro Tour Rivals of Ixalan in Bilbao! Rei Sato’s previous best result was a Top 4 finish at Grand Prix Shanghai in 2015, and today, he bettered his own record by winning it all! As he travels to Albuquerque for Pro Tour Ixalan - he qualified by winning a Pro Tour Qualifier at Grand Prix Las Vegas - let’s hope his shiny trophy doesn’t exceed his baggage allowance. Once again, congratulations to Rei Sato, your Grand Prix Hong Kong 2017 Champion! 731 players converged in Hong Kong today but only 245 will return tomorrow for six rounds of Ixalan Booster Draft. Among them, only three players, namely (14) Lee Shi Tian, Jacob Hart, and Tay Jun Hao finished 9-0.
Notable players who were close behind include Riku Kumagai, Kazuyuki Takimura, and Teruya Kakumae at 8-1, as well as Ryoichi Tamada, (12) Kelvin Chew, Tomoharu santo, Shuhei Nakamura, and Tomohiro Kaji at 7-2. With two Booster Drafts and six more rounds to go tomorrow, the climb to the top was getting tougher and tougher! Come back tomorrow to catch up with us or scoot over to Grand Prix Liverpool and Grand Prix Phoenix as the adventure continues!